Habitat: The plant is endemic to Europe. Grows in mountain areas of Europe and Siberia, on nutritient-poor silicaceous meadows, moors and heats. Description: Perennial plant, grows to 0, 6 meters tall. Stem is round and hairy, with one to three flower stalks on the top. Leaves are green, slightly toothed and hairy at the top, and rounded near the bottom. They are topped with broad, yellow flower heads, which appear from May to August. Parts used: Flower heads, either fresh or dried. Useful components: Derivatives of thymol. useful in treatment of hand osteoarthritis. 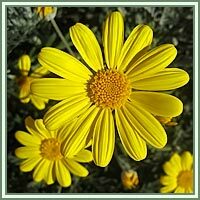 Arnica also promotes wound healing, due to thymol derivatives, which act as vasodilators of subcutaneous blood capillaries. It also helps in cases of inflammations caused by insect bites, swelling caused by fractures, and muscle aches. 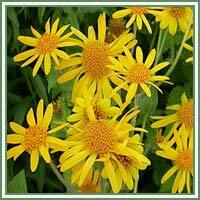 Safety: Arnica contains helenalin, which could seriously damage your health if high amounts of plants are eaten. Helenalin can produce gastroenteritis and internal bleeding. Sometime contact with the plant causes skin irritation. Some herbs could react with certain medication. Therefore, it is advisable to consult your doctor before consumption of any herb.